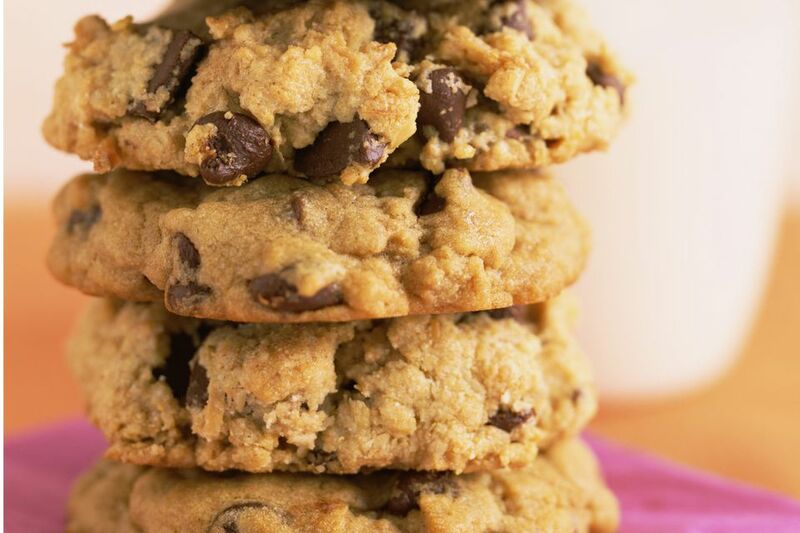 Some kids hate nuts in their cookies, but you can leave them out and add more chocolate chips, or add some butterscotch chips in their place. These are wonderful cookies with plenty of chewy texture provided by the oats and optional chopped nuts. Make these cookies for a weekend treat or bake them for a party or bake sale. Heat the oven to 350 F. Grease baking sheets or line it with parchment paper. In a bowl, combine the flour, baking soda, and salt. Blend well and set aside. Cream the butter, brown sugar, and granulated sugar until light and fluffy. Beat in egg and vanilla extract. At low speed of mixer, beat in flour mixture, blending well. Fold in oats, chocolate chips, and chopped nuts. Cover with plastic wrap and chill for 2 hours. Shape the cookie dough into 1-inch balls; place them about 2 inches apart on the prepared baking sheets then flatten each cookie slightly. Bake for 10 to 12 minutes, or until the cookies are set. Cool in on baking sheets for a minute then transfer to racks to cool completely.